Bingo gaming as smooth as silk and rich in quality is what players want. Silk Bingo is the online experience that offers this and so much more. Slip into something silky from the comfort of your home and play bingo in an ambience of sheer classy appeal. Lavender the scent of tranquility is the color scheme on an elegantly put together homepage. The site is soft and unlike many other bingo sites who can be a bit garish. This won’t discount the thrills of winning because once inside the lobby a world relaxation and excitement are rolled into one great atmosphere. Player Testimonials are fun to read and inspire players in high hopes of being the very next winner. The FAQ tab is a valuable tool and describes the site down to every detail and answers most questions you may have. The history of Bingo is detailed on the homepage and makes for fun and interesting facts. Silk Bingo is launched by the amazing Dragonfish software. They are no slouch when it comes to premium bingo products powering some of the most popular brands in the online industry. Games are licensed by the Government of Gibraltar. High 5 Bingo is a Swedish version of Bingo that has gained much popularity throughout the world mainly because there is an incredible 5 ways to win. Traditional 75 and 90 ball bingo are also available and all variations offer daily Progressive Jackpots. These Jackpots are pooled from a percentage of bingo cards purchased by players and continue to climb until one lucky winner claims a bingo in the required number of bingo calls. The Coverall games are extensive with a daily schedule offering huge Jackpots and Guaranteed Jackpots including One Million big ones up for grabs. Speaking of a million that is exactly what the top winning team will win in Loyalty Points competing in Team Bingo. Take a spin on one of the many one arm bandits in a fine collection of Slots to choose from. Wagering starts at a mere penny per line and offer huge Jackpot payouts. The graphics are land based casino quality and that’s because some of the games are in brick and mortar casinos! At the top of the list the Free Bingo is worth mentioning first because at Silk Bingo they offer a super generous package of Free 4 All games with a staggering £6,000 given away on a monthly basis. Exclusive promotions include holiday packages, special event offers and big Jackpot games. You will find big Deposit Bonuses on all your deposits and the new player will be treated to an even bigger Deposit Bonus! Join Facebook and follow Silk Bingo on Twitter for special promotional offers. The BFF Loyalty program is a perfect way to show appreciation to the most loyal and valuable players. Silk Bingo will roll out the red carpet with exciting exclusives and VIP promotions. Silk Bingo has all the right qualities needed to succeed with a fantastic software, Free Bingo and loyalty program. It is where millionaires are born and players who like to indulge in silky elegance. 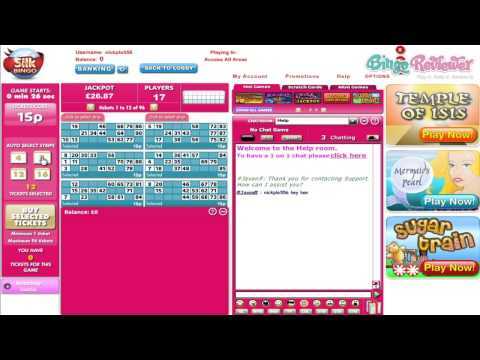 We rate Silky Bingo with 4.5 Pink Hearts. All I can say is that Silk has the best design ever!!! And they have good games going with great prizes! Silk Bingo is a good enough site, really. The games are good. Most everything else is at par with other sites. Silk Bingo is about the only site I know that gives away bingo cards for free when you are new. And I like it that they only require a £5 minimum deposit. This is a great site when you are just a beginner. I have been with them for quite some time now and the good news is that I've been racking up the loyalty points they give. Imagine having earning points that can be converted into cold hard cash just for playing bingo. Not a bad deal huh? i love how they accept a lot of payment options... you have the option to choose which credit card you want to use. for me, this helps in budgeting and knowing your finances and managing it. They have a really nice amount of free bingo available here every day of the week. At Silk Bingo, they don’t need a reason to give away freebies. Here, the free games are for everyone, not just those who put the most money into the site or are at the highest loyalty levels possible. This is the way it’s supposed to be done. When you play free bingo here, you have the opportunity to win over £200 free each day and over £6,000 every month. They also have one of my favorite versions of bingo here which is Zodiac Bingo. Players have the chance toward £1,111 guaranteed jackpots every month. Even Mondays are a blast at the here. At the beginning of each week is magic Monday, where you can take advantage of 2 hours of happy hour bonuses from 4pm to 6pm.Overall I really enjoy playing here and I would definitely recommend it! The Bingo that you’ll get here consists of 75 and 90 Ball varieties. There is a huge collection of patterns that can be played when it comes to 75 Ball, so players can take their pick and get started. Try for the lucky spin on a series of thrilling slots offering fun features like bonus rounds and free spins. Popular games include Doctor Love, Amazon wild and Slots with up to 100 lines. Instant Games and Scratch Cards can be found as well. You can keep track of their “Specials” page for a complete list of daily events, such as chat games, tournaments, Guaranteed Jackpots, Progressive Jackpots, parties and plenty more! Their welcome bonus is pretty nice. Upon registering, you get £20 free to play with as long as you make a first deposit of at least £10. They’ll even throw in a free box of popcorn for signing up. Silk Bingo offers players a wide variety of fun and games and bingo. Playing here is a lot of fun and you can read the player's comments and see how much they are enjoying playing and winning at Silk Bingo. With all your favorite types of bingo - the high five Swedish bingo games, 75 ball and 90 ball with varying prices and many open rooms all day long. The free bingo is awesome and there are plenty of opportunities to play even if you have not yet funded your account. The 100% sign on bonus is a great way to get more bingo for your money and not a bad offer. Reload your account for more bonus money as well. Enjoy bingo games or try your hand at instant games, scratch cards, and of course all of the great Dragonfish powered slots. These are very fun to play and you will be familiar with most of them if you play at other dragonfish sites. There are many jackpots available and you can tell by the winners lists that these are paid out quite regularly and of course this is very popular with the bingo players at Silk Bingo. No players from the US, though, so check out the list of countries that can play and be sure to get on board at Silk Bingo if you are eligible. The winning never stops and you might as well play along for your chance to win a nice prize. All in all a good site for bingo lovers. I hope you enjoy playing here, it seems to be a very nice smooth running site. Have fun and win big. This site is easy to navigate and really smooth looking. It was easy to register as well and I had no problems at all signing up and I was ready to play in no time at all. The welcome offer consists of £20 free when you make an initial deposit of a minimum £10. They also have decent deposit bonuses on virtually every deposit you make and you can’t go wrong with that. They have a total of 120 bingo, slot and instant games with guaranteed jackpots up for grabs. You’ll find standard 75 and 90 ball options here, as well as Swedish bingo. Another great thing about this site is that they offer really fast cashouts. You’ll actually see at the bottom of their homepage, it says they guarantee a 95% real payout rate. I really enjoy this site and have had nothing but good experiences here. I was very impressed with their free bingo as well! I was lucky to find Silk Bingo, another one of the great Bingo sites using Dragonfish software. The site looks good enough, not the best I have seen, but quite good for all the purposes. It's easy on the eyes and I like the dark red color they use for background. You will find all the most important links straight away, even a list of their sister sites, which is very nice of them. There's a 200% sign up bonus for new players and that is it, together with a 50% reload bonus. There is over 120 waiting for you, and I was really impressed with the choice. Bingo sticks with the regular choice: 75 and 90 ball games, that you can find almost everywhere, together with the High 5 bingo, new and really great looking variant, that plays quite fast and makes the whole thing more interesting. I made a good balance on this site, with bingo and slots, and I plan to stay here for a while. New players, min dep £10 for 200% Free spin up to 60 spins + 100% Bingo Bonus up to £30. Bingo bonus WR: 4x (deposit+bonus). Each spin capped at £0.25 and can be played exclusively on Temple of Ausar, WR: 85x(bonus). Games Bonus wins cap: £400 + the initial bonus amount. UK only - your deposit balance is available for withdrawal at any time. Withdrawal restrictions & full T&C’s apply.